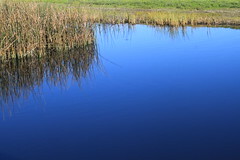 The Freshwater Trust (TFT), a 501(c)(3) nonprofit working to protect and restore freshwater ecosystems, is partnering with IBM Research and SweetSense Inc. , a provider of low-cost satellite connected sensors, to pilot technologies which can accurately monitor and track groundwater use in one of the largest and most at risk aquifers in North America. Additional research support will be provided by the University of Colorado Boulder. Click here to continue reading at the Freshwater Trust. California Coastkeeper Alliance, Orange County Coastkeeper and California Coastal Protection Network have appealed a Superior Court ruling that upheld the decision of California’s State Lands Commission to approve the lease of state-owned tidelands for a controversial Orange County desalination project without a full environmental review. The public interest groups filed a lawsuit last October challenging the State Lands Commission’s decision, seeking a full study of costs and alternatives for the billion-dollar project, proposed by Poseidon Resources. Their appeal comes on the heels of a Municipal Water District of Orange County analysis that concluded Poseidon’s for-profit desalination plant is the least cost-effective way to meet water needs in Orange County. The county has several active proposals for rainwater capture and water recycling projects that would cost less, save energy, and reduce polluted runoff. A winter storm blanketed the Pacific Northwest this week, from the beaches of the Pacific to the Cascade Range and beyond. Snow and ice in Seattle and Portland closed schools and slowed traffic with hundreds of crashes. SNOTEL sites in the Cascade Range reported depth increases from 1 to 14 inches in the last few days. Although the recent snow helped to boost the overall snowpack in the region, most of the SNOTEL and snow course sites are below to well below normal for the beginning of February. 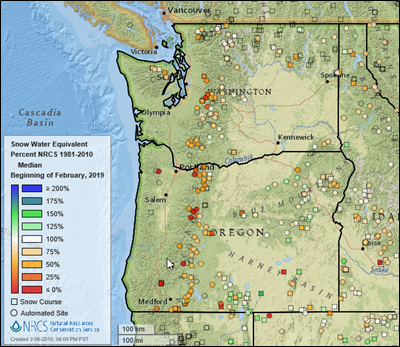 The dry winter follows a dry 2018 with the U.S. Drought Monitor reporting much of Oregon and Washington in drought conditions. Meanwhile, in California the same storm caused rain, flooding, and heavy snow up to 10 feet in the Sierra Nevada.